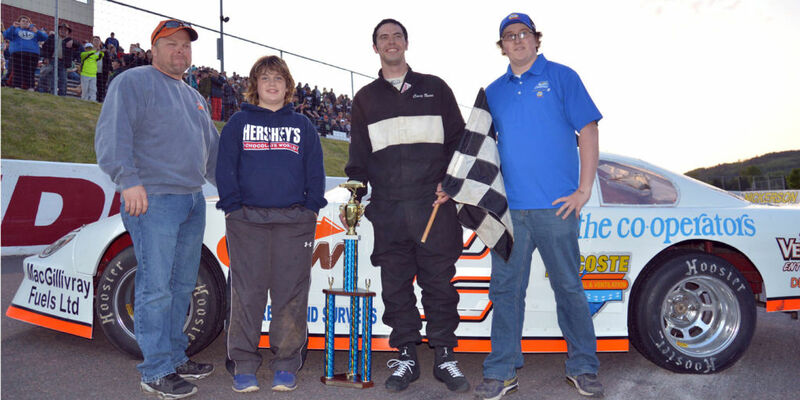 JAMES RIVER, NS – Hometown favourite George Koszkulics (New Glasgow – #88, pictured above)) won the Ron MacGillivray Chev Buick GMC 150 Saturday night at Riverside International Speedway. It was the veteran driver’s fifth career Parts for Trucks Pro Stock Tour victory and came after he took the lead from Nova Racing teammate Donald Chisholm (Antigonish) on lap 135 of the 150 lap main feature. Shawn Turple (Enfield) finished third after a thrilling 15 lap battle in the final laps of the race against Jonathan Hicken (Brudenell, PE.) Cole Butcher (Porter’s Lake) rounded out the top five of the Ron MacGillivray Chevrolet Buick GMC 150. Chisholm laid down an impressive 14.335 second lap to take the Atlantic Tiltload Time Trials award and followed it up with a win in the King Freight Dash For Cash featuring the top eight cars from Atlantic Tiltload Time Trials. The remainder of the starting lineup was determined through the Dartmouth Dodge Heat Races which saw Greg Proude (Springvale, PE) and Robbie MacEwen (Charlottetown, PE) victorious. Exide Batteries Rookie of the Race Award went to Joel Hickox (Cornwall, PE) with an 18th place finish. The Ron MacGillivray Chev Buick GMC 150 was run in just under one hour with just five cautions. Twenty-four cars entered the event. Following DeCoste to the finish line (unofficially) were Jason Lund, Darren Wallage, Kyle Reid, Joey Rudderham, Chris Reid, Dale Richardson, Darren Price, Bronsen Shanesey, Hughie Richards, Russell Smith Jr., Cole Tanner, Pete Miller, Wade Slaunwhite, Jeffrey Breen, Joey Livingstone, and Daniel Delorey. 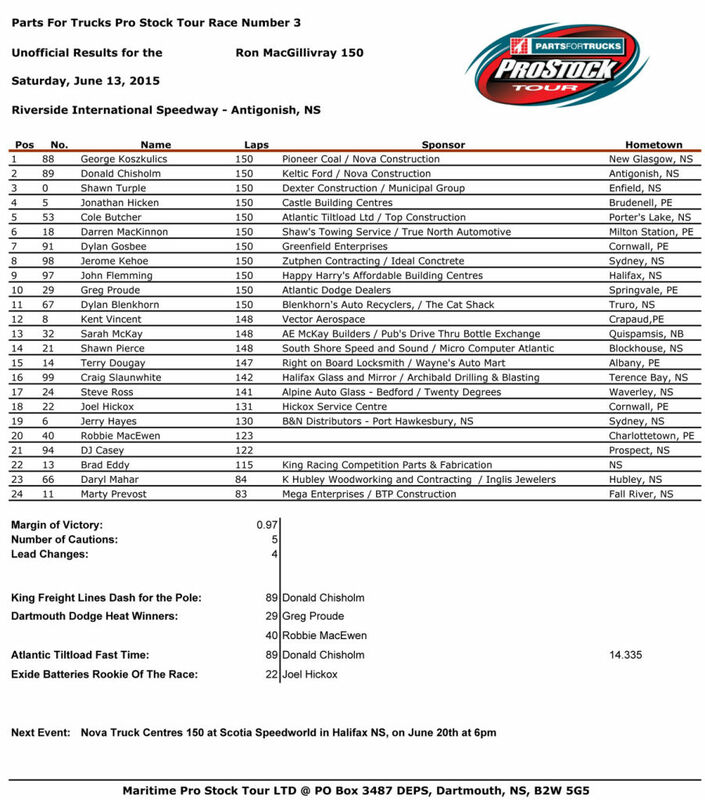 The Parts for Trucks Pro Stock Tour returns to Scotia Speedworld next weekend for the Nova Truck Centres 150 on Saturday, June 20. Admission for Saturday’s Lockhart Truck Center 150 is $25.00 for adults; $5.00 for youth; pit admission is $30.00. Children 7 and under are admitted for free. Tickets will be available at the gates on race day (Cash Only). Visit www.maritimeprostocktour.com for all event information. Management at Riverside International Speedway now turn their full attention to preparations for the IWK 250 Presented by Steve Lewis Auto Body, widely known as one of the most entertaining stock car races in Canada and this year set to feature two-time NASCAR Camping World Truck Series champion Matt Crafton as the celebrity driver in the Cat Car for Kids. Camping spots are now more than 90% full for the IWK 250 Super Weekend and expected to sell out before the event. Advance reserved and general admission tickets will be available this week for the IWK 250 – visit our IWK 250 event page for camping and ticket information. If you missed the Ron MacGillivray Chev Buick GMC 150, or just want to relive the excitement, the full flag-to-flag audio broadcast is available from our friends at Race Time Radio.